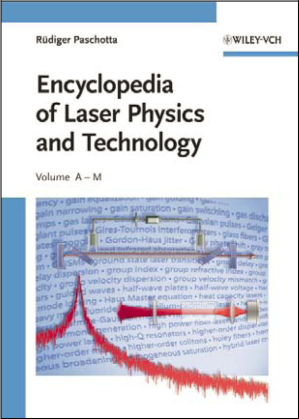 Abstract: A print version of the Encyclopedia of Laser Physics and Technology will appear soon. It can already be ordered. Preparations for a print version of the Encyclopedia of Laser Physics and Technology are nearly finished. The encyclopedia will be printed in two volumes, with all illustrations in color, in total with well over 800 pages. It should be ready for delivery in autumn 2008. You can already order the encyclopedia via the website of Wiley-VCH. Note that you can profit from the subscription price of 249 € until January 31, 2009. Thereafter, the price will be 299 €. The work on the print version has had a substantial impact also on the online version, as the changes resulting from the publisher's copy-editing and from further thorough checks have also been implemented there. This has improved both the technical content and details of the layout. The online version will continue to be available for the public without charge and without any registration. I am happy that RP Photonics can in this way continue to deliver a valuable service to the worldwide optics and photonics community, including researchers in developing countries with limited access to expensive publications. I am also grateful for the feedback delivered by part of the readership, most often using the feedback form (which allows the sender to stay anonymous, if this is preferred). The feedback is very encouraging and also helps to improve further the content. Feedback delivered in the very next few days has a chance to be considered for the printed version as well.